The UCB Touring Company performs at over 200 colleges and performing arts centers every year. 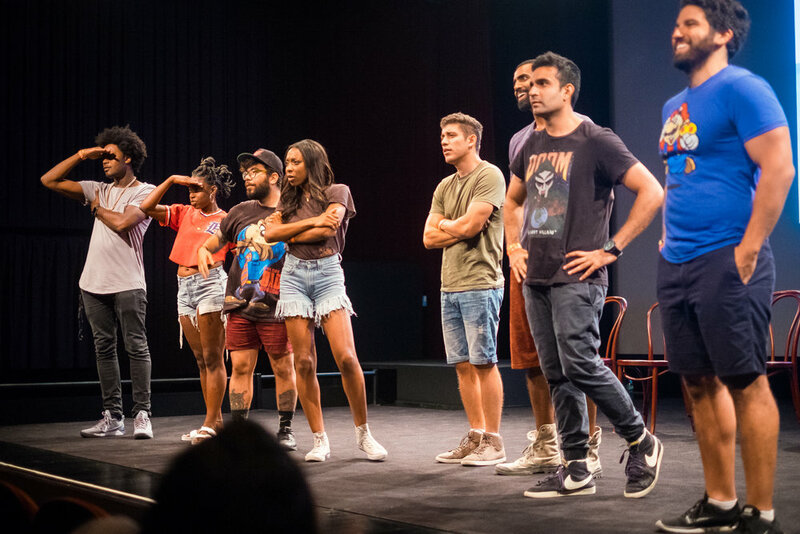 We pull talent straight form our theaters in New York and LA, including performers you've seen on Netflix, MTV, Comedy Central, Saturday Night Live, The Chris Gethard Show, Insecure, The Good Place and many more. Our improv shows start with an interview with an audience member or special guest, followed by an on-the-spot improv set that's never been seen before and will never be seen again. UCB’s Life on Campus show has been touring colleges across the US since [YEAR]. Four improvisers at the top of their game interview a volunteer from the audience about life at your school. AzN PoP is the world's first Asian-American pop group from the USA. Join Baby Rice, Quirky Rice, Edgy Rice, Competitive Rice, and Brown Rice as they kick off their tour by dancing, singing and rapping about boys, friendship, and systemic racism and oppression! CUTE! You’ll never feel like the only Latin person in the room once you’ve watched Latinxyz -- UCB’s all-Latinx touring improv group. Tell us about a time you WERE the only one, and we’ll imagine what would have happened had that not been the case. Post-twentygayteen, it’s all fair game -- we want you to tell us about something you find queer af and why. A book you’re reading. A childhood photo of you. Frisbees. Grapes. You tell us -- and we’ll improv it to life. An excellent show about Black Excellence, ICONIC is all about the Black icons in your world. Invite a special guest — a respected member of the community, a star alum, a star athlete — and we’ll ask them all about their life. Then we’ll celebrate that life with a totally on-the-spot improv set.